On 6 March 1957 a new pub opened in Blackfen: The Jolly Fenman. It had three bars: the Kingfisher Lounge, the Saloon Bar and the Public Bar. On the walls were paintings of geese and ducks as well as a specially commissioned painting ‘The Kingfisher’ by Edward Ward, RA. (I wonder what happened to that painting?). There had been a competition to name the new pub, and the winner was Mr Robert Tidy of Curran Avenue who got a £25 prize and the honour of drawing the first pint of beer. A few days after the anniversary of the opening of the pub, thanks to a great find at the Animal Protection charity shop in Blackfen, I became the proud owner of a framed 1977 price list from the Jolly Fenman. A pint of bitter would set you back 32 pence, and a bottle of Babycham 23 pence. That day, 10 March, would have been my dad’s birthday, so I was thinking of him stood looking at this price list which was hanging in the pub! I would love to know where it has been residing for the last few years and why it has suddenly surfaced. The original Woodman Public House was built by George Staples, a publican and wood merchant, in 1845. 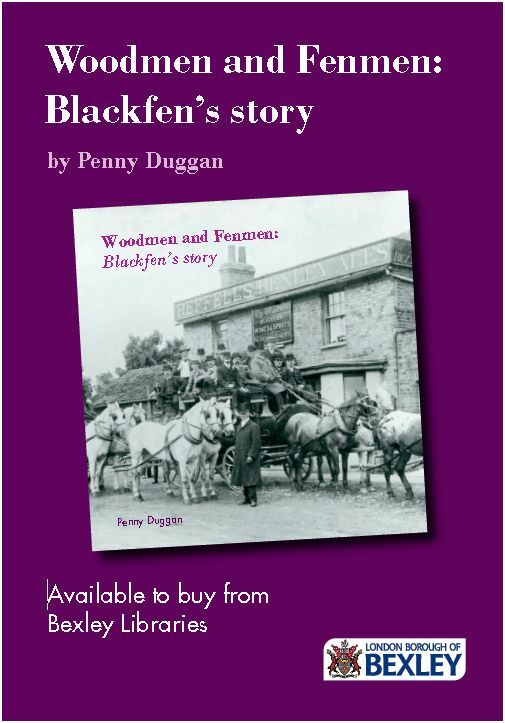 At that time there were only nine families living in the hamlet of Blackfen, so he must have been catering for the passing trade on the road from Eltham to Bexley. After his death in 1859 his wife and son took over the running of the pub. There was a tradition that Charles Peace, a notorious burglar around southern London, frequented The Woodman and treated all the customers to a drink. (He was put on trial and executed in 1879). From 1914 the landlord was John Alfred Harvey, a retired slaughterman who was known for keeping a pet goose. By 1930 it was clear that the old pub no longer met the requirements of the district – farmland was being sold off and hundreds of houses were being built. The new Woodman Inn was built in 1931, erected behind the old one so that business could continue – this explains why the present pub is at an angle facing the crossroads. A locally listed heritage asset is a building or structure which is deemed to be of local architectural or historic interest and is included on the local heritage list drawn up by Bexley Council. There are several in Blackfen, and a few just outside which are so close it seemed a shame to omit them here. They make a positive contribution to the area’s local character and sense of place, and they are offered some level of protection by the local planning authority. 177-179 Blackfen Road (corner of Burleigh Avenue). Known as Westwood Cottages, or Maxwell’s Cottages, they were built in 1890 to house workers on Westwood Farm. A footpath led to the farmhouse which was at the site now occupied by the children’s playground at The Green. George Staples pub, 271 Blackfen Road (formerly The Woodman). Built in 1931 by the architect, Kenneth Dalgliesh, it replaced an earlier pub on the site. Edward VIII pillar box, Tyrrell Avenue. Only a small number of letter boxes were made during the short reign of Edward VIII in 1936 and after his abdication, most boxes bearing his cypher were modified or replaced. So a surviving one is a rare sight. ARP warden’s shelter, Wellington Avenue, near The Oval. Used during the Second World War as part of a network of shelters for ARP wardens. The Three Blackbirds pub, 118 Blendon Road. Licensed as far back as 1717, it was rebuilt after being gutted by a fire around 1900. Blendon Lodge, 167 Blendon Road. The West Lodge, built in 1855/56 stands at the corner of Blendon Road and The Drive. It had four rooms and a garden and housed various staff of Blendon Hall which was demolished in 1934. (The East Lodge, built at the same time as the West Lodge, was at the corner of today’s Beechway and was demolished in the 1930s). Listing of a building or structure on the national Statutory List marks and celebrates a building’s special architectural and historic interest, and also brings it under the consideration of the planning system, so that it can be protected for future generations. The Chapel House, 497 Blackfen Road – Grade II listed. Decoration giving the impression of a ‘chapel’ was added to the cottage when John Boyd of Danson acquired the parcel of land on which it was sited. Jay’s Cottages, 1, 2, and 2a Blendon Road – Grade II listed. Jay’s Cottages, originally known as Blendon Villas, have stood in Blendon Road since the early 18th century to house workers on the Blendon Hall estate. They still have a lack of rear windows which was intended to stop the inhabitants gazing over the grounds of the Hall and invading the privacy of the Hall’s wealthy residents! Woodman Parade smartening up cont. Thanks to the sunshine, we managed to finish weeding the pavement and painting the railings at Woodman Parade, Westwood Lane on 29 April. Well done to everyone involved over the last two weeks. And thanks to the ice-cream van man and The Broken Drum for much-needed refreshments afterwards! At 10am on Saturday 22 April a group of volunteers met to paint the railings and weed the pavement along Woodman Parade in Westwood Lane, Blackfen. We were joined by Rt Hon. James Brokenshire, MP and Councillors Louie French, Cafer Munur and Lynn Smith. Despite the rain (how unlucky!) we carried on and it has made such a difference in just a couple of hours. Thank you to Raw Hair Salon for the tea/coffee and biscuits! We will return soon to continue the job. And happy 2nd birthday to The Broken Drum!